Pork tenderloin was the very first thing that I prepared sous vide. The hardest thing for me to get accustomed to with sous vide was the temperature. The standard cooking range considers medium rare to be 145 degrees F and medium to be 160 degrees F, sous vide temperatures are a bit lower - medium rare is 130 degrees F and medium is 140 degrees F, however you are cooking for much longer (determined by the thickness). When you read more about how the USDA recommends cooking temperatures, it is based both on temperature AND time. It is still hard to adjust, when you have been going by one set of rules your whole life. I will admit that my first time cooking sous vide, I was a little too nervous and cooked the tenderloin to 149 degree F (which is considered medium-well). It was still juicy and tender, but I enjoy it much more around when it is cooked to 140 - 145 degrees F, so the choice is yours - just do your research, follow your manufacturers instructions, and come to your own conclusions. My immersion circulator (Anova) has an app that syncs to the device and you can select the recipe you want to cook within the app, the doneness (medium rare, medium, etc. ), and it will set the device for you or you can manually set it. I feel very Inspector Gadget with these little techie tools. Well Done: 160°F / 71°C for 1 to 4 hours - Dry with a firm, tacky texture. Fold down edges of vacuum sealed bag and place pork, aromatics, two butter pats, and garlic and seal or if using a ziploc do the same, but use the water displacement method. Once water bath has reached set temp, drop bag in and set the timer. I did this tenderloin at 149 degrees F for 1.5 hours. While pork cooks, make cherry salsa by combining all ingredients and storing in fridge until you are ready to server pork. When pork is done, heat an iron skillet on high, clean aromatics off pork and coat in a high-heat oil like safflower or canola and sear pork until browned on all sides- about 2 - 3 minutes on each side. 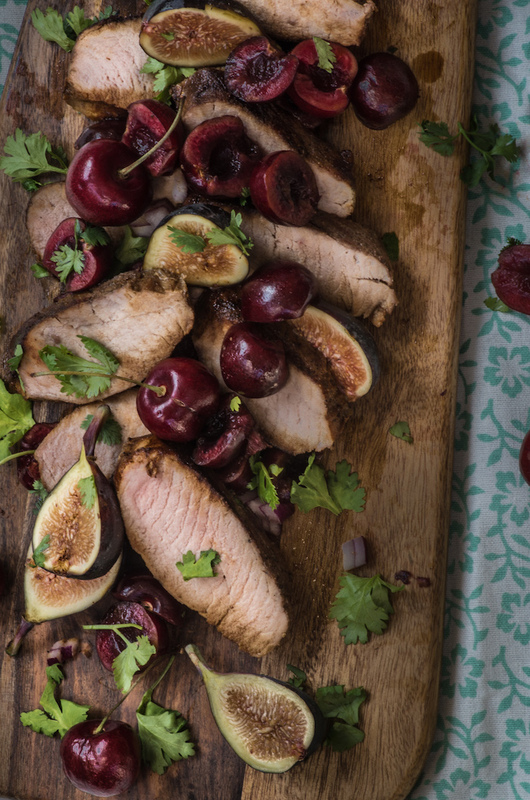 Let pork rest for 10 minutes, then slice, drizzle with honey and top with cherry salsa.